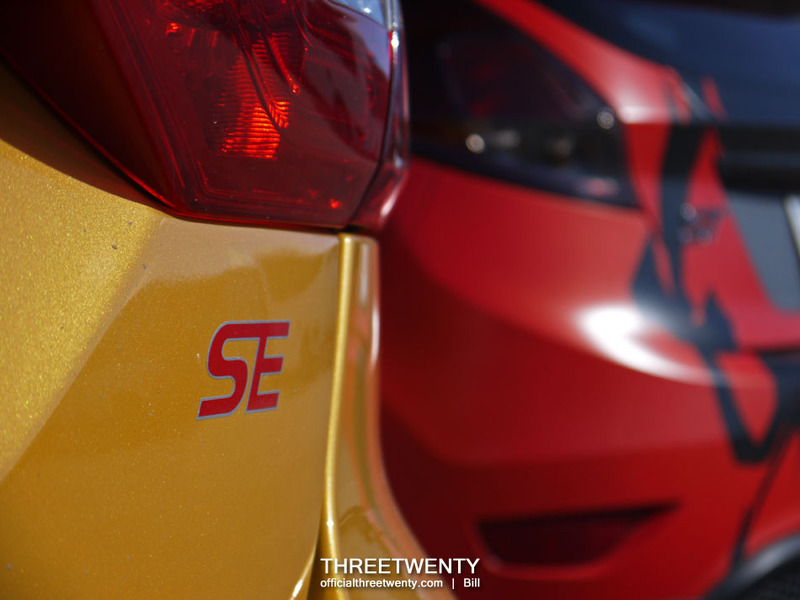 For today I thought I’d share some bonus photos, taken during the Fiesta ST (FiST) photo shoot. Naturally I wasn’t going to leave without taking some photos of the Fiesta and my Focus together since they’re so bright. I decided to save them for a separate post so as to keep the focus on the Fiesta alone during part 5 of its coverage, however. For anyone hoping for some in-depth coverage today, sorry. Just a few random photos and quick commentary. It’s a nice afternoon and the Grey Eagle and Beyond meets are tonight; time to enjoy the weather rather than read blogs. Haha. Starting off with the imposter, sitting off to the side while I was shooting the mini ST.
A comparison of the two front ends; recently a teaser of the 2015 Focus ST (FoST) was released and it looks like the main grille will be shorter, possibly more like the Fiesta ST’s. I can’t wait to see the car fully unveiled later this week. Also, visible here is the problem that the cup spoilers were designed to fix; note how on the Focus the bottom of the front bumper sits noticeably higher than the side skirts. In my opinion (and 1552’s apparently) they should be even. Here, it almost looks like something is missing. I wasn’t really actively posing the cars together for photos, I was mainly concerned with keeping mine out of the backgrounds of other shots. The Fiesta can look fairly tiny next to the Focus, but the Mk1 Focus was actually about the same size. Cars keep growing at an almost alarming rate. While it may be tiny though it’s absolutely packing a bigger punch in this case. 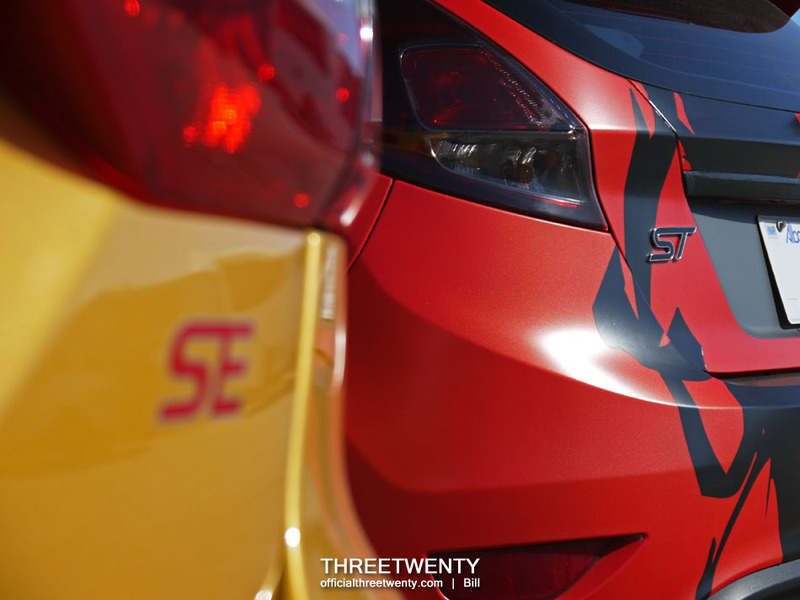 One odd feature is that the ST emblem is on the left for FiSTs while it’s on the right for FoSTs. I don’t know why Ford decided to reverse the badges on the cars but it let me do this at least. This was one of my favourites from the day so I’m closing the post out with it. I hope you enjoyed this mini post today; and I hope to see lots of people out at the meets tonight! Previous Post Previous post: Emblems Pre-Order has Started!